What is a Cue? | Train Positive Dog! 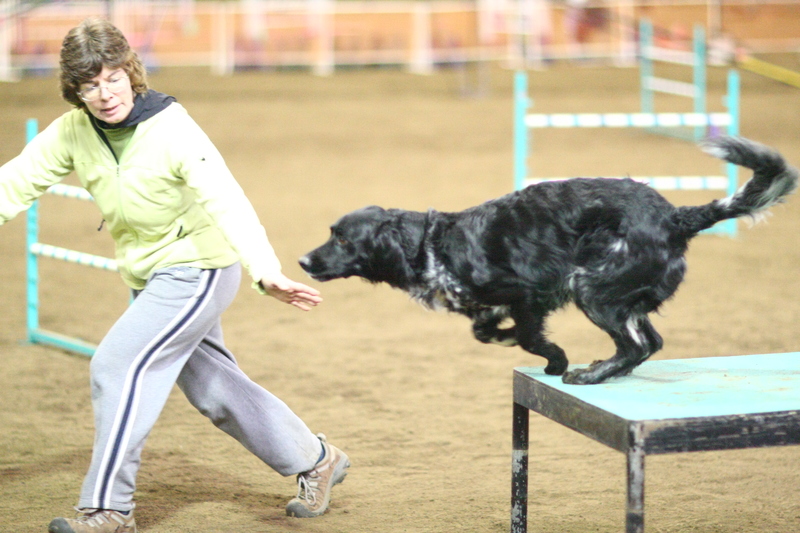 A verbal release, my forward motion, and a hand signal are all cues that signal Arrow to leave the table and drive forward to the next obstacle on the agility course. The cueing event can be a word spoken by a person, but also could be a sound, hand signal, or object; a light turning on or off, or multiple events. The cue is a signal to the dog – do this now, and you may be reinforced. If the cue does not elicit the wanted response, the trainer does not give reinforcement. The dog simply loses his chance to earn reinforcement which is something the dog REALLY wants (treats, toys, going outside). Positive reinforcement increases the frequency of the behavior. Unlike commands, cues are taught without aversives and do not carry the threat of punishment. A cue should be simple and different from other signals that your dog already knows. Make a list of cues that you think your dog knows. Each cue should signal a specific response and be easy to give consistently, so your dog is not confused. Often I hear people say “Sit Down!” when they have previously taught “Sit” and “Down” as different actions. What is the dog to do? Each cue should also be distinct from other cues and signals of praise. For verbal cues, short words with distinct sounds are best. Hand signals that stand out from a distance and are uniformly delivered are great. Animal trainers often use whistles because the sound is consistent and carries over a long distance. When training new behaviors, a cue is not added until the behavior is reliably offered by the dog. Think of a traffic light – the green light is not easily confused with other signals. But what if you are color blind or looking elsewhere when it turns green? When a dog doesn’t respond to our cue, we often assume they ignored us. 1. Your dog’s brain was fully engaged in another activity and they did not hear you- you need to get your dog’s attention first: more training is needed. 2. They don’t know how to respond – more training is needed to link the cue to the behavior. 3. The environment is too distracting – more training is needed for the dog to be able to respond reliably. 4. Your cue is not consistent – Is your tone of voice always the same? If not, you need to train for variety in how you give your cue. 5. Your dog is relying on additional cues from your position or distance from them-more training is needed for your dog to generalize the cue to new situations.